and I swoon and dream just a bit. the tree belongs to my kids. That is how I remember it growing up. and it is one of my fondest memories. "All the bells go at the bottom of the tree because when Grandpa was a kid he was naughty and used to sneak a look at his presents. So, his mom made him put bells at the bottom of the tree so they could hear him." I cannot deny them these same memories, so I pretty much let them have at it. When they finish I add a few snowflakes and glittery ribbons. So is my tree a magazine, drool-worthy show stopper? - No, but it is all about family and making memories. I HATE the ugly tree stand. anything to hide the green and red plastic thing. But this year...I have beat the ugly tree stand. 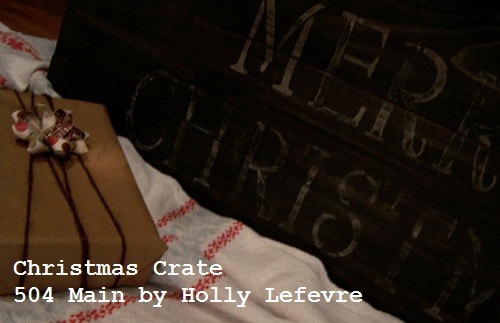 I decided to make a big ole crate to go around it - one that looked like maybe it fell off Santa's truck and was once full of toys. So I took the leap and started building. It was SO EASY AND QUICK. I made the box unless than 45 minutes. I roughly put the whole thing together - I was not striving for perfection - I was going for rustic and well-loved. When I was done, I finished it with Varathane in a rich Ebony and a simple stencil in white. Here is how to make it! I tried to use supplies I had lying around. NOTE: These measurements for boards accommodate my tree stand. Just measure your stand give it about 2 inches extra for "clearance"
Your three frames will be finished. Stack the three boxes on top of each other. Lay the three remaining 25" boards inside and place one in the center and then center the other 2 between the center board and the sides. You can also make the bottom solid - truth, I ran out of boards...this works just fine. Place the 4 12" long 1x1 pieces into each corner - THIS WILL HOLD THE CRATE TOGETHER. Screw these pieces into place from the sides - One screw in the middle of each side board goes through it and into the 1x1. Sand really well - I used my Dremel to sand all the edges for a rounded finish. 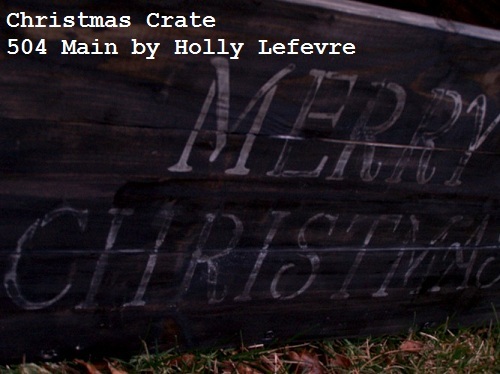 BUT my crate still looks rustic. 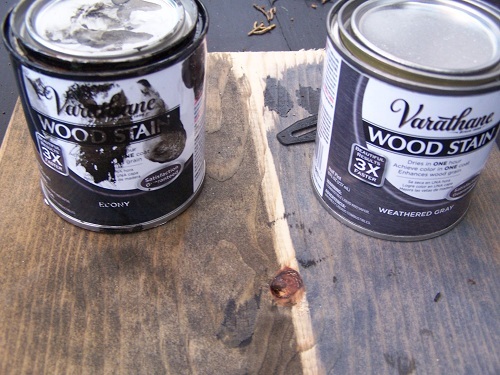 Wipe clean and prepare a surface for staining. Place a drop cloth on the ground/table. 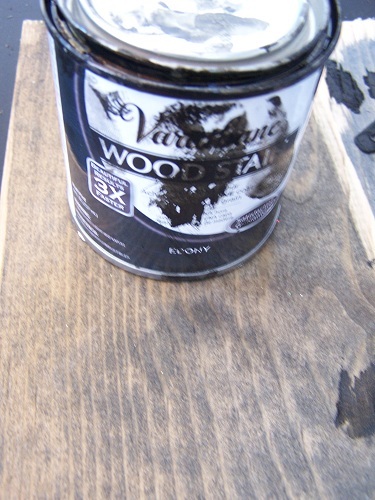 I had received samples of RustOleum Varathane in Ebony and Weathered Gray. I decided to use the Ebony on this project. I love the color and it went on so well and evenly. One coat, perfect coverage, and dry in about one hor - just like the can says! Repeat the process all over including the interior or the box. Determine your wording. I used "Merry Christmas." Find the center of the crate and place your letters accordingly. "Merry Christmas" is easy. The first "R" is the center of Merry and the "S" is the center of Christmas...so line those up under each other and add the other letters on each side. I use a strip of Scoth Blue Painters Tape to keep my letters lined up. Paint Merry. Let dry for about 20-30 minutes or until you touch it and not much comes off (every climate is different). If you wipe too soon, too much paint will come off and you will have a big blurry mess. Basically, Merry was almost dry. Wipe/Rub Merry with a wet paper towel. It will seem like white paint is going to ruin your masterpiece, but if it is dry enough, paint will adhere to the wood and the "smeary" part will come off with the paper towel. Let the "wet" wood dry. Repeat the process for the other words. Once all dry, I applied a light coat of the Varathane again and wiped it off quickly. I did not use a wood sealer on this, because I was short on time...but before it goes back into storage I will be using one. So, bye-bye ugly tree stand (well not really, what I love about this is that I get the security of a durable tree stand that will not leak water onto my hardwood floors and the beauty of my Christmas Tree crate. I am working with my new camera...so soon my photos will be gorgeous! disclosure: I received samples of the Varathane Wood Stain and decided to use them on this project. Ok so I just put up my tree and was thinking I needed a box like this... it's too late for now because the tree is decorated but I'm thinking I could make a 3 sided box "front" like yours to hide the stand somehow... Thanks for making me think! Your tree looks beautiful Holly! Wow, Holly! Your tree stand turned out beautifully! Absolutely love it. 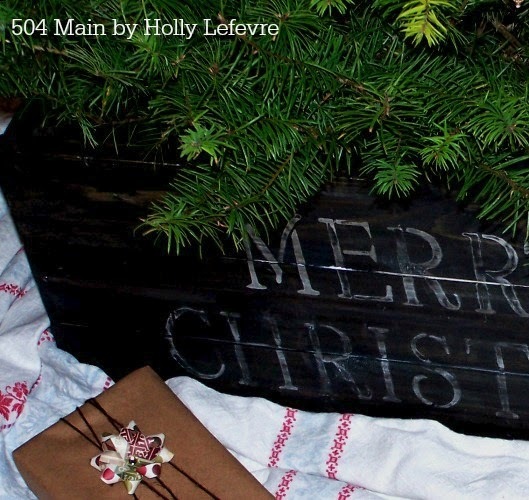 A magazine-cover worthy holiday project. P.S. We really missed you guys at the tree farm this year. Hoping we can resume the tradition next year. 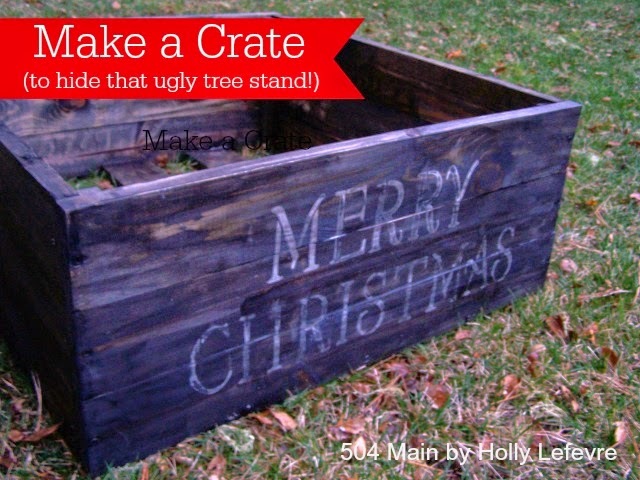 Super cute ... and such a fun alternative to the tree stand! OOh I so want to do this next year! Love it, so charming. Oh I am sooo doing this next year! That turned out GREAT! 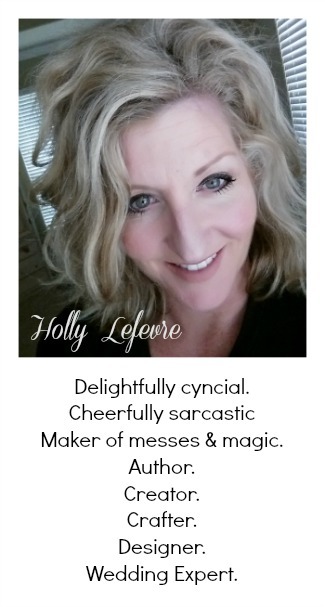 Love this, Holly! The entire look is fantastic, and I love your happy accident! Your crate looks great. I love this idea and there are so many possibilities. 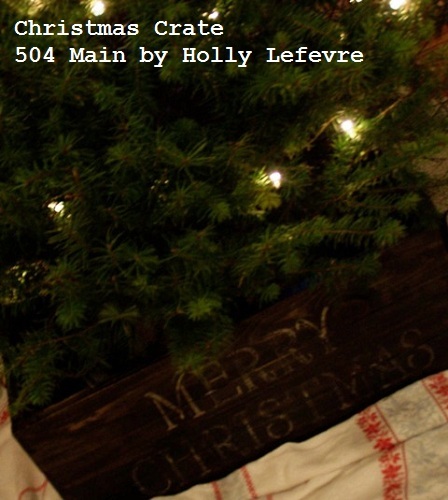 I love your crate...so pretty...and that cute little elf who was testing it out sure is a sweetie! Love! Really love the ebony stain you chose, it makes the rest of the tree and decorations pop! Toffee: Three Ways to Goodness! Let's Shop and Support Blogger Friends! Carrot Crunch Gingerbread: Have A Grain Holiday!